This week has had its ups and downs weather wise but fishing has improved. It is far from red hot but it is getting better. Guys who troll with downriggers and whose fishing habit is more than just a once a month interest are catching some really nice fish. This week I have seen a 29 and 31 pound Chinook hit the docks. Mooching has been very slow. We had a few Chinook trips this week and as always networking and figuring out the pattern is the key to success in Westport. Kings are being taken in 200 to 300 feet of water down 90 to 140 feet on the downriggers. 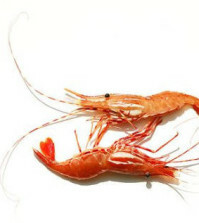 Bait has been the primary choice of most at this point in the season. The surface temperature is warm but the fish are hanging just below the thermocline. If you find bait work the area hard. The outlook for Salmon fishing in Westport over the next month is really still a big question for all of us. The current trend shows us having plenty of Chinook to make it until the August 21st closure. However, it also is showing us that this year’s Chinook run is just trickling in at this point which give us a bit of concern as to the health of the 2016 run. Stay tuned for more. 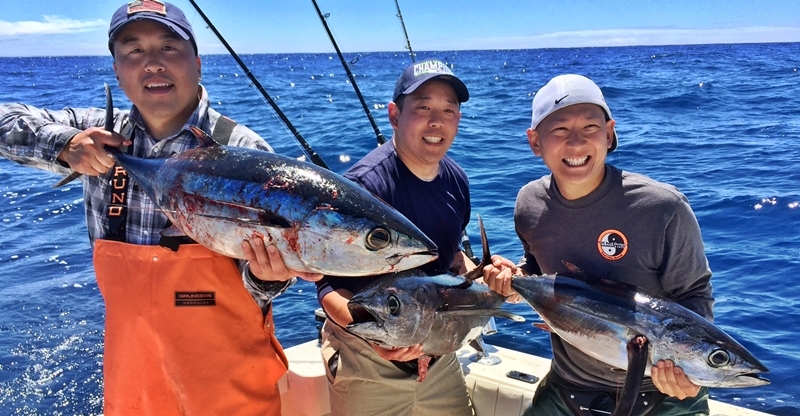 Report by Kevin Lanier, owner of KC Sportfishing Charters 425-328-8558, President PSA Ocean Anglers, VP PSA State Board. Photos by Cyndi Lanier, Owner of Dockside Art,Gifts,and Tackle Westport Wa. 425-328-8559. The cover image of this week’s fishing reports was also contributed by Lanier. 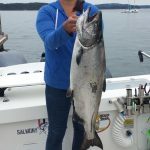 According to the Washington Department of Fish and Wildlife, Chinook fishing is expected to be “Excellent” in Marine Area 4 during July. 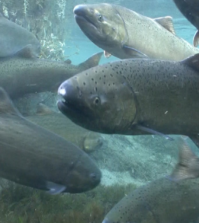 According to the Washington Department of Fish and Wildlife, Chinook fishing is expected to be “Excellent” in Marine Area 5 during July. 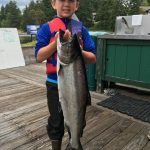 According to the Washington Department of Fish and Wildlife, Chinook fishing is expected to be “Excellent” in Marine Area 6 during July. Carol won this all inclusive trip for two to Queen Charlotte Lodge on Haida Gwaii. Worth $10,000, this is a trip of a lifetime, and has been on Carol and husband Andy’s bucket list for years. They’ll fly in on a helicopter, and be treated like royalty as they enjoy some of the best fishing on the planet. Thanks so much to QCL for the donation, and to Bellingham PSA for all their hard work. Proceeds from this drawing go to the Bellingham PSA scholarship program. Awesome job, we were stoked! 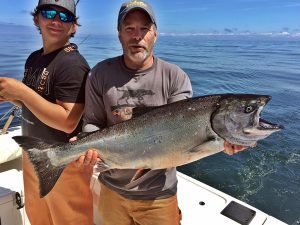 The Bellingham Puget Sound Anglers Derby took place last weekend. This event was a bit different than in years past, due to the changes in retention this year. 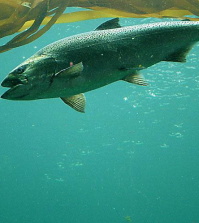 In July, only hatchery fin clipped Chinook may be retained in Marine Area 7. 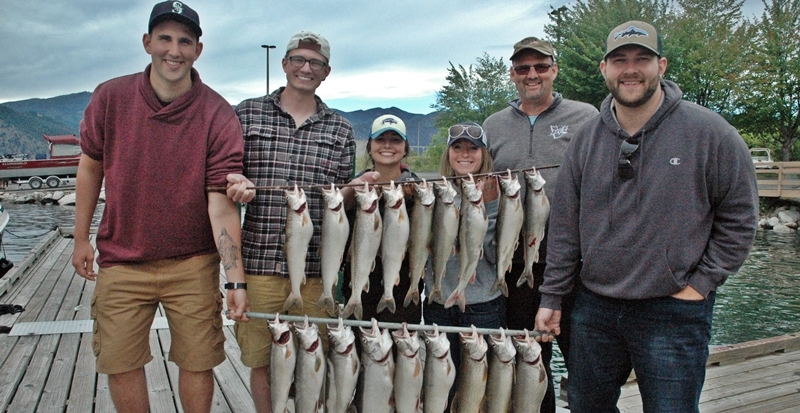 The fishing wasn’t red hot, but some larger clipped fish did hit the scales. Jeff Brown ended up with the biggest King, a 22.04 lber, weighed in at the start of the first day. This derby is a very fun, kid friendly event, with proceeds going to various worthy causes. Thanks to all who participated, and who ran the show. Jeff Brown took home $7500 for this big clipper. Young Floyd Holman weighed in this 14.48 lber to take an early lead in the kids division. Floyd and the rest of the Holman family of Friday Harbor were part of our crew on the new Team Parker. Alex Davis would bump Floyd from the top spot. Carol Holman landed this 16.5 lb Chinook, that would be the largest weighed in by a female angler. 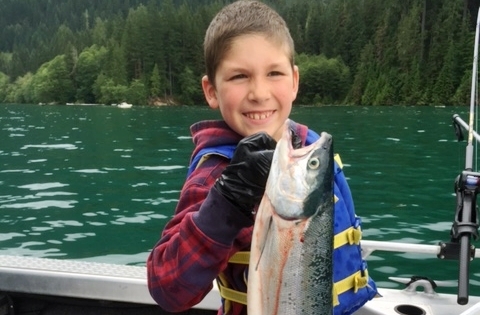 The Washington Department of Fish and Wildlife (WDFW) reports “Fair” prospects for cutthroat in Marine Area 8.1 during July. The Washington Department of Fish and Wildlife (WDFW) reports “Fair” prospects for cutthroat in Marine Area 8.2 during July. FINALLY! Get ready for the Area 9 Salmon opener this weekend. The weather looks great and the incoming tides should be bring some nice Kings in. We have been fishing the San Juans and Canada the past couple of weeks with some good action on the Silver Horde Herring Aide 3.5 inch spoon. We are tying this long up to 60 inches behind a green/glow flasher using 25 pound mono. Try getting away from the crowds and fish deep in 200-250 feet of water. Watch for marks and bait on your sounder and fish where the fish are. Be safe and be boat friendly and we will see you on the water ! 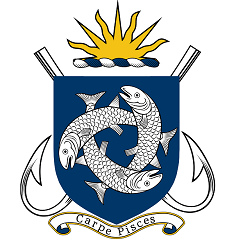 Report submitted by Nelson “Spud” Goodsell of Salmon for Soldiers (FISHTALE 2). 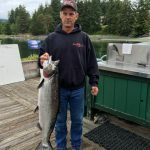 The Chinook salmon fishing has been pretty good recently with close to a 1 salmon average with the current limit being 2 Hatchery Chinook most of the Chinook salmon are being caught near the Clay Banks and the Shelf area between Pt. Defiance and Pt. Dalco. The fishermen that are Trolling and Jiggers are producing the most but mooching with herring is working ok when the Dog Fish are not in a feeding frenzy. The crabbing continues to be a little slow but improving, try different depths and different baits some of our regular fishermen are being successful. There are also reports of Squid being caught off of the area docks at night. For a more updated report call 253-591-5325. Crab fishing opened 7/01/16 in Area 11 and is open in Area 13 as well. Point Defiance Marina has rental boats and motors and launch and overnight moorage facilities with pump out stations and shore power. In addition we have storage space for boats up to 17 feet as well as kayak storage. For more information call 253-591-5325. Basic Fishing Classes are offered throughout the summer months. 2 Hour classes are $15.00 and can be designed for youth and adults. Boat House Tackle Shop open 7 days a week. The Washington Department of Fish and Wildlife (WDFW) reports “Good” prospects for cutthroat in Marine Area 13 during July. Baker lake was slow on Sunday. Lots of boats. We got a few at 40 feet and lost two more. Awesome day on the water. Report submitted by Dane and Gabe of Team Rod-Dog Arches. What continues hot is trolling for Lake Trout on Chelan early in the morning on the Bar with the best chance of the year for big fish. 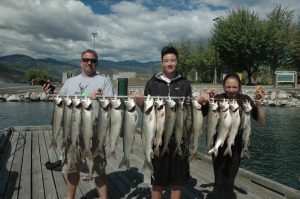 Also continuing hot is trolling the face of Manson Bay for numbers of Lake Chelan Lakers. On the Bar, look for depths from 120 to 170 feet deep. Evenings are best in Manson Bay in depths of 120 feet near Wapato Point and up to 270 feet deep in the center of the bay. As always, fish within 3 to 5 feet of the bottom and keep your speed around 1.2 mph. The Mack’s Lure Bead and Blade combo our guide, Jeff Witkowski has developed has been very productive. He uses a bead combo to give the rig about a 4” long profile. Similar in profile, the Needlefish squid rig by Silver Horde / Goldstar has also worked. Bait these rigs with a chunk of Northern Pikeminnow. The T4 Purple Glow Flatfish seems to be the “go to” lure for bigger fish on the Bar. Brad Southam of Bothell, WA with son Bryson (14) and daughter Kassy (11). Your fishing tip of the week is to rethink how you fight fish on Lake Chelan. Remember, the only way these fish will get away is if they tear or shake the hooks out of themselves. They are trapped in open water with no structure to get into and they are not a fast swimming / hard fighting fish. The trick is to do everything in moderation. The rod tip should be at a moderate rod angle. Don’t point it at the fish, but don’t raise it to a high angle to increase the leverage the fish gets when it twists and turns or shakes it’s head. The retrieval speed should be moderate. Not glacially slow, but not fast. When the fish isn’t doing anything, go a bit faster to keep moderate tension. When the fish is twisting or shaking, slow down to reduce the leverage the fish has. Keep your drag moderately light. A good average is netting 3 of every 4 hooked fish. If you are getting less than half, review what you are doing. Your safety tip of the week is to really keep your head on a swivel now that we are in the heart of our busy summer season. There are lots of inexperienced boaters out there traveling at various rates of speed. Remember to get your head around and look before altering your course. Also, with hot weather coming, I can’t say enough about keeping hydrated! This past Saturday was the conclusion of the Big Bass series of four events to qualify to fish the finals. In the qualifying events each hour had a winner for a cash prize. Points accumulated then permitted 38 anglers to fish this one day event. Cash prizes were paid out with the 6th place taking home $500 for a 5.07-pound largemouth. The winning team of Jake Boomer and Tim Carvo earned the Big Bass Champions with a 7.15-pound largemouth they had caught the week before. The winning cash prize was $6375 and bonuses brought them up to $7000. 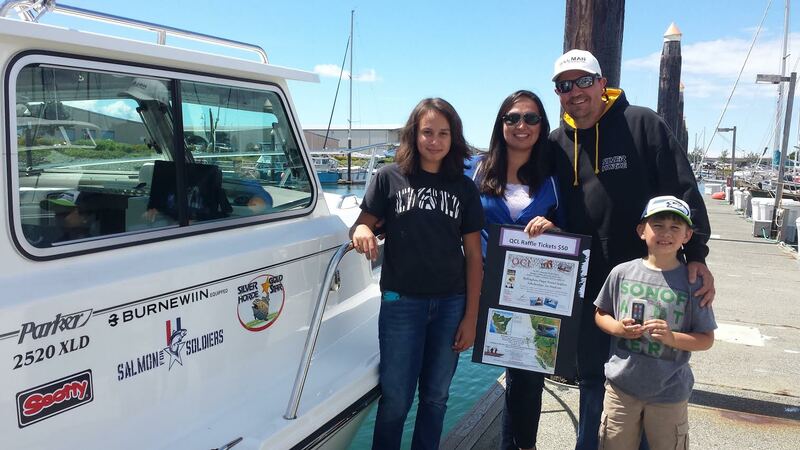 The primary sponsor of this event was Limit Out Marine with the owner Russ Baker as master of the ceremony. Overall it was a very good event with no fish dying in any of their events. This event was held at the recently remodeled Mardon Resort. The lake is dropping but much slower then normal with cooler temperatures. Walleye and perch fishing is slow but will be getting better as the lake drops. I ran into a longtime and retired guide, Skip Davis, and as always he had lots of stories to tell. Most recently he was on Corral Lake before 5am and working down the lake he looked up on one of the rock walls to see a cougar. A first time in all his years to see one, so it is not a common sight. Salmon fishing was SPOTTY BUT PICKING UP this past week. The Trap Shack, Beechey Head, and Aldridge Point were the most productive locations to fish. Most of the chinooks were running less than 10 lbs in size but there were few larger ones too. Gordy Caruthers caught a 14 lb spring at the Trap shack on anchovy fished in a glow green/white teaser fished at 69’. Anglers using bait are finding anchovies in glow teaser heads have been working well still. Spoons, such as the G-Force and Skinny G, in Bon Chovy or Outfitters’ colours were also effective. For flashers, the Purple Onion, Lemon Lime and Bon Chovi have been good. Very few halibut were brought into the marina. Rich Allen, son Tom, Greg Wild and son Jack caught halibut with weights of 54, 52, 51 and 43 lbs in southwest Haro Strait. Salmon fishing was SLOW this past week. There are some fish in the area, just not too many of them and they were scattered. Anglers fishing with bait have been using anchovies or tiny strip in Glow teaser heads. 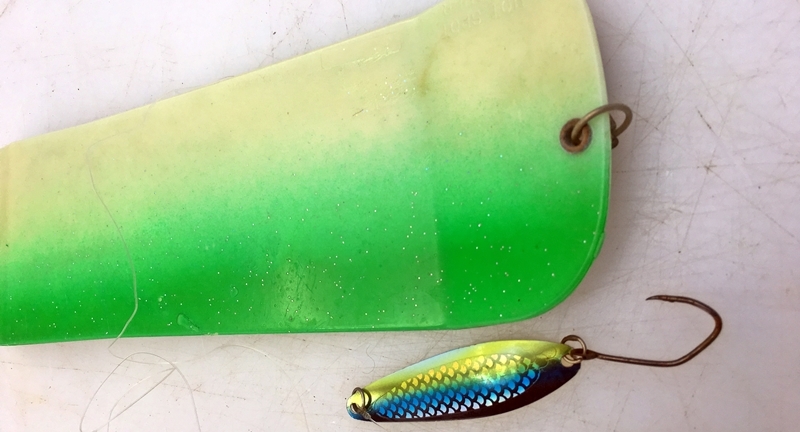 Good trolling lures have been Coho Killers, Bon Chovi or Outfitters Skinny G spoons and APT Needlefish spoons. Drift anglers have been using Needlefish Darts or Deep Stingers. Halibut fishing was GOOD this past week. The halibut being brought in were ranging from 20- 60 lbs. Rich Allen, son Tom, Greg Wild and son Jack caught halibut with weights of 54, 52, 51 and 43 lbs in southwest Haro Strait. They were using salmon and greenling heads to fend off the dogfish and fishing in 275 feet of water. Anglers that were fishing were using extra large herring, salmon bellies and/or octopus for bait. Also working well was the 9” Jumbo Squid in Green Glow. Also working well, and discouraging to dogfish, was the 9” Jumbo Squid in Green Glow. Salmon fishing was HOT AND COLD this past week. Almost all the salmon were caught inside the bay. There was a lot of bait in the bay and anglers jigging near the bait schools were hooking salmon. The springs were mostly on the small side, but fish up to 18 lbs were taken. There has also been the occasional chinook that is over the slot limit size for retention. Anchovies also caught fish, but not as many. Flashers that are popular include the Betsey, Lemon-Lime and Madi. Halibut fishing was GOOD this past weekend. The best areas were Race Rocks, William Head, 27 Fathom reef and Constance Bank. Anglers that were fishing were using extra large herring, salmon bellies and/or octopus for bait. Berkley Gulp and Powerbait soft plastics also work very well. You can also use Mudraker, Lucky or 9” Jumbo Squids if you want to stay away from the dogfish. Salmon fishing was VERY SLOW this past week. Most everyone was getting skunked. Trollers fishing with tiny strip or anchovies were using Bloody Nose and UV Green teaser heads. Anglers using spoons found Coho Killers, Gibbs Needle G and AP Tackle needlefish spoons were successful. Anglers jigging have also been catching springs and are using Needlefish Darts and Deep Stingers. The Powder Wharf and Shag Rocks area are popular for jigging salmon. The salmon fishing was SPOTTY BUT PICKING UP this past week. Sombrio and Sheringham Points were the best spots for fish. One day, the creel survey recorded 20 salmon kept from 20 boats surveyed. A few hatchery coho were in the mix. Most springs are not too large but there are some large, unclipped springs in the area as well as some fin clipped springs up to 24 lbs. Kieran Cardinal picked up a 24 lb spring on anchovy at 55’ in a UV Chart Flash teaser head. Thomas Brandwood picked up a 20 lb spring on anchovy at 47’ in a UV Chart Flash teaser head while fishing with Kieran. The top choices for Sooke anglers are the White Lightening or Irish Cream Coho Killers trolling behind the Madi or Bon Chovi Flasher. Hootchies in Cop Car, Purple haze and White have been effective in the past month. Anglers fishing off Sherringham Point, Otter Point and the Bluffs have had the most success this past week. Fishing for salmon was SPOTTY BUT PICKING UP off Victoria. The best fishing was out at Constance Bank where most fish were taken. There were a few caught along the waterfront too. On Saturday, Ken Bury used a 2½ oz Delta Mac Fish jig to land a 21¼ lb hatchery fish while jigging near a bait ball in 35 feet of water. He also had 3 other springs on the line for a while. Anchovies were a good bait to use and Glow and Purple Haze have been the most popular colors for teaser heads. Spoons and squirts were successful in getting hook ups as well. Good choices in plastic baits are the Pink Haze and White Glow. Green Spatter Back UV Coho Killers, Gibbs Outfitters or Bon Chovi Skinny G trolling behind a Moon Jelly flasher has also brought results in Victoria. Bass fishing is EXCELLENT. At this time of year most of the bass are in the shallows. During the day, soft plastics rigged Carolina style work well and crank baits can work well too. Soft plastics rigged “Carolina Style” are also a good choice when fishing drop offs and docks. The most productive colors in 4” Yum baits are Smoke or Pumpkinseed. Langford Lake, Shawnigan Lake, Prospect Lake and Elk and Beaver Lakes are the best local bass lakes. St. Mary’s Lake on Salt Spring Island is also a great lake for bass fishing. The Oregon Department of Fish and Wildlife reports that spring Chinook are available in decent numbers, and angling is improving. Trolling herring or large bladed spinners are the most productive techniques. Keep your gear near the bottom while trolling slowly.